To build a competitive part-time nanny resume, you must ensure that your resume paints a picture of a trustworthy person. 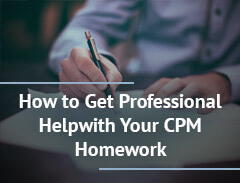 Start off strong with a summary statement that addresses your certifications and licenses. Complement this with a prominently placed certifications section that provides more detail. In your work experience section, illustrate your achievements and duties. Here, get into specifics, such as the specific ages of the kids you have you watched. Add in additional information, such as if you have experience working with special needs children. 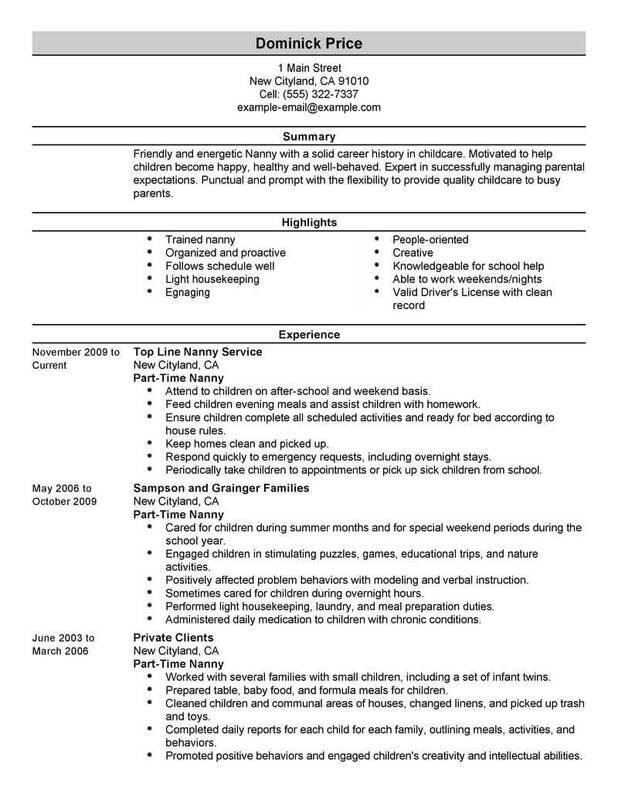 For more help, see the part-time nanny resume example. A part time nanny provides child care for busy families. It’s an important job, and to get it you’ll need experience, the right personality, and a resume that shows off your qualifications. 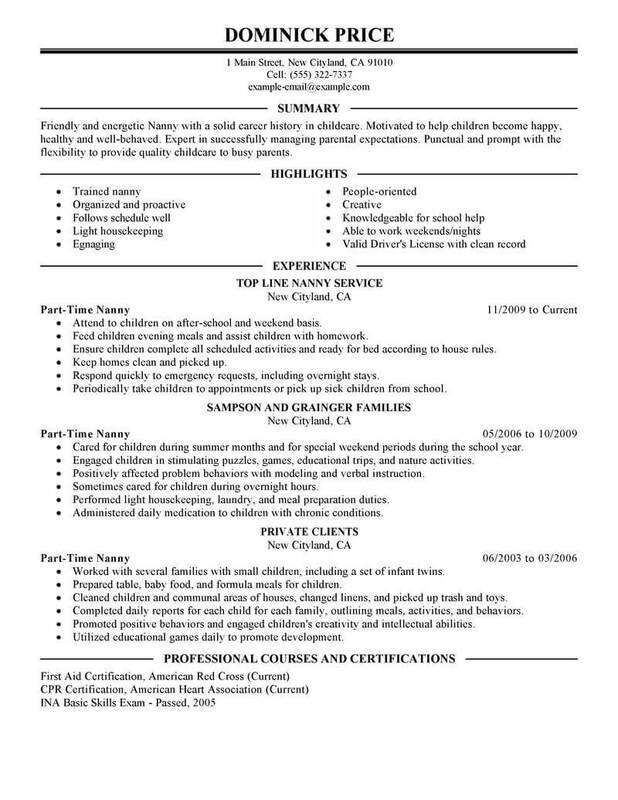 The resume examples below can help you create your own part time nanny resume faster. Don’t wait any longer to get the career you want–click any of the resume examples below to begin building your resume now. Finding jobs as a part time nanny means having the right mindset and putting to use certain job-seeking skills. Following the tips below can help keep you on track during your job hunt. 1. Keep a positive attitude. You may feel discouraged to find yourself temporarily out of work, but staying positive will keep you relaxed and can help you enjoy the opportunity of taking a new step in your career. 2. Set goals for yourself. An effective way to break down the process of finding a new job is setting attainable goals that you can accomplish daily or weekly. For example, you could send out a certain number of resumes per week. 3. Join a support group. Support groups exist for those temporarily out of work, and these gatherings can provide emotional support as well as concrete resources and connections to help with your search. You never know where your next lead could come from. 4. Network as much as you can. Reach out to personal and professional contacts who could offer help or advice on your field of interest. 5. Maintain your online presence. Making use of social media sites such as Facebook, Twitter, or LinkedIn can help expand your network and also help potential employers access your professional profile. 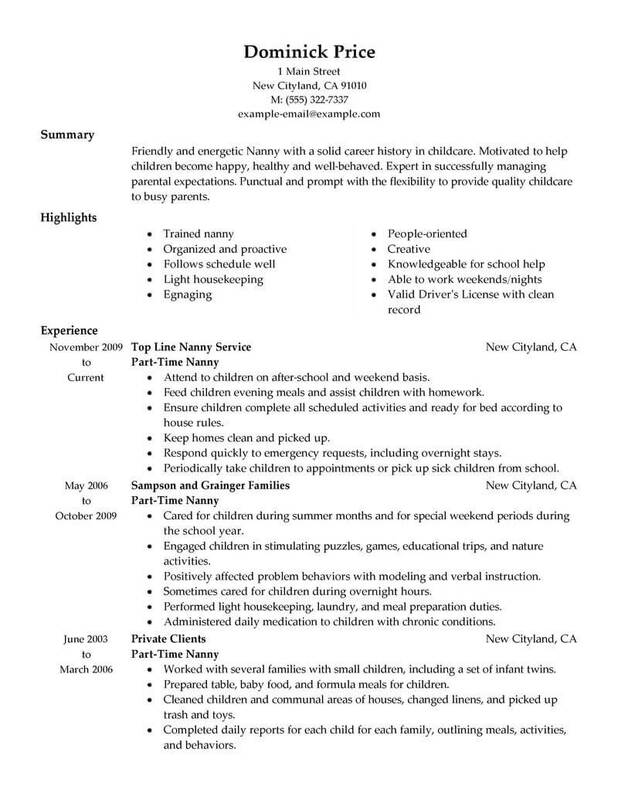 In terms of finding jobs as a part time nanny, your resume will be your calling card. Follow the do’s and don’t listed below and make sure your resume is in top shape. 1. Do not exceed two pages. Unless you are a doctor or academic who is using curricula vitae (CVs), there is no need in writing more than two pages. 2. Do align the text flush left and make use of bullet points for listing items. 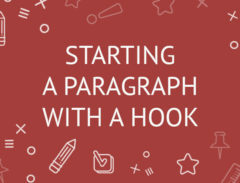 These simple formatting tricks will improve the readability and clarity of your text. 3. Do not use generic language. Avoid the overly-used phrases, such as hard working and goal oriented, as they will not add much individuality to your resume. 4. Do include a Summary of Skills section to introduce your work history. This gives the reader a quick glance of your professional qualifications.